Your car is your baby -- you spend every moment you can keeping it clean. 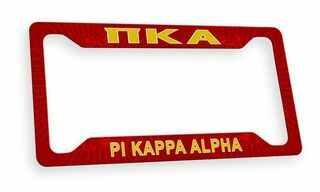 For a car or truck that truly stands out from the rest, get Pi Kappa Alpha Car Merchandise and License Plate Frames. There's nothing quite like the thrill of buying your first new (or used) car. It has that fresh new car smell, and it's also a clean slate for you to add your own personal touch. If you're a proud Pike man, get a few items for both the interior and exterior of your new ride. A Chrome License Plate Frame is always a beautiful addition to a car, and it can be a great asset when you're traveling to different schools. 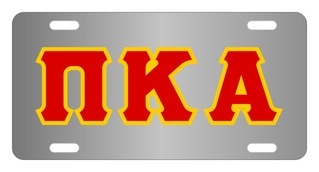 If you purchased a truck or jeep that has a hitch, get a Pi Kappa Alpha Trailer Hitch Cover to put over it when it's not in use. 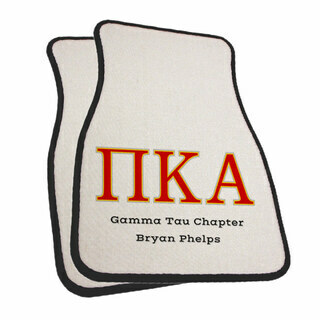 A pair of white fraternity Car Mats will really brighten up the look of your car's interior. 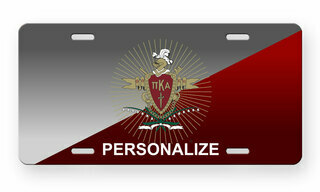 Some of our Pi Kappa Alpha Car Merchandise and License Plate Frames come with customization options. Think of how you'd like to decorate your vehicle for the coming school year then make it a reality by placing your order for fraternity car d�cor at GreekGear.com . 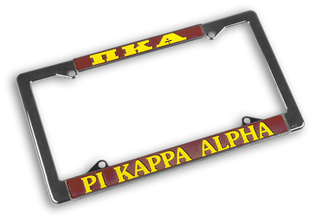 Pi Kappa Alpha Car Merchandise & License Plate FramesThe Greatest Selection. Period.